This book has received remarkable accolades because it is a perfect match for golfers of every ability level as well as golf coaches and teaching professionals. 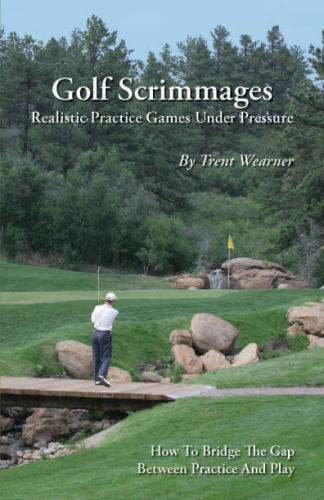 Its 230 pages mainly consist of nearly 100 games that help golfers practice the types of shots encountered on the course while at the same time under the same pressure that is felt on the course. With this many competitive practice games you’re sure to find plenty of new ones along with some familiar ones that have an added twist. It is crucial to practice in the same environment in which you’re going to play. To do this, two components must be introduced to your practice – Pressure and Physical Conditions that are similar to the golf course. Pressure is applied through a scoring system, a goal and a consequence if that goal is not attained or a simple contest against a friend. Physical Conditions found on the course must also be present. This includes different lies, awkward stances, various situations and circumstances as well as varying your club and target. A lack of these components is why so many golfers have a hard time transitioning a respectable game to the course. It creates a wider division between the practice tee and the first tee. The games within this book are what make practice more similar to playing and therefore more meaningful and effective. A description of every game in the book along with its rules and variations are clearly laid out. Additionally, a color photo complements almost every game in the book.